I’ve mentioned my feelings about bananas in the past, so I don’t need to rehash old news. And now you’ve clicked on that link, seen the recipe for Chocolate Chip Banana Muffins and are thinking to yourself, “And nor do you need to rehash an old recipe”. But I’m not, I swear. Okay… maybe just a little. The difference this time around is that I used normal sized chocolate chips, and I didn’t pile chocolate chips on top of the bread. So…yeah. They obviously couldn’t be more different. But in all seriousness, sometimes you just want to make a loaf of bread instead of the hassle of individual muffins. Maybe you have an aversion to single serving foods. Maybe you plan to take a bubble bath and eat the entire loaf yourself. I don’t know – I’m not here to judge. 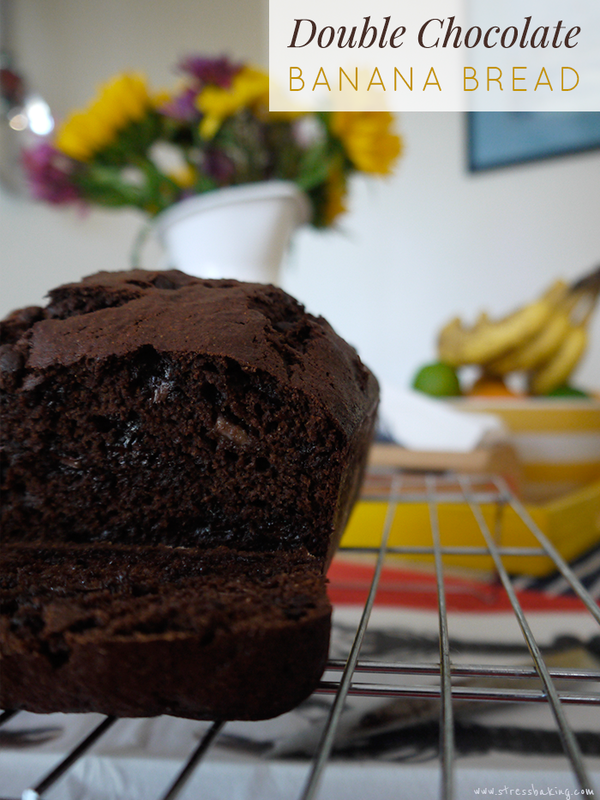 Regardless of the reason, loaves of banana bread are comforting and adding chocolate only makes them better. It’s rich, flavorful, and filling. You only need a single slice to quell your growling stomach in the morning. After I perfected the recipe, I made this two more times in the matter of a week to use up the bananas you see there in the background. My coworkers enjoy when I make too much food because they benefit from it. – You want the bananas to look diseased. This is a running joke in my office because I have coworkers that enjoy yellow bananas, and others that enjoy what we call “diseased” bananas. All that means is that they’re covered in black spots, and that means they’re ripe. If they’re straight up black that means they’re overripe (and those work wonderfully, too). It just gives a stronger banana flavor. – You can just mash the bananas, or you can briefly throw them in a food processor if you don’t want any chunks of banana in the bread. You hardly notice them anyway because of the chocolate chips, but if you’re not going to be able to sleep at night knowing there’s a chance, just toss the banana in a food processor for a few seconds. You don’t want it to be liquid, so just keep that in mind. You also might not get as many nice cracks on top of the loaf with a less chunky banana texture – but maybe you hate those, too. Man, you’re picky aren’t you? Jeez. Preheat oven to 350°F. Spray a 9×5 loaf pan with non-stick spray and lightly flour. In a small bowl, mash your bananas and set aside. In a large bowl, beat together eggs, sugar and oil until well combined. Add banana and vanilla, beat well. Add flour mixture into wet mixture and stir until well combined. Add chocolate chips and gently stir to combine. Pour batter into prepared pan and bake for 60 minutes. The top should be cracked and spring back if touched. Let cool in pan for about 5 minutes, and then move to a wire rack to cool completely. Don’t skip this step! If you let it cool completely in the pan, the bottom will turn out soggy and nobody wants that. Serve warm with a little butter spread, or just eat it plain – it’s delicious without anything additional. Enjoy! Wrap tightly in plastic wrap and/or foil to store for up to a week. Can be frozen for 3-4 weeks.